Why Won’t My Weimaraner Listen To Me? Do you have to raise your voice every time you want your Weimaraner to listen to you? Does your Weimaraner always come or sit on command – anytime and anywhere you want him to? If you are not happy with your answers, it is time you seriously reconsider your role as a sincere Weimaraner puppy trainer and an ideal pet parent. This Weimaraner puppy is learning the sit command. Before you begin any obedience training for puppies, you must first establish yourself as the “ALPHA dog” of your family. Your Weimaraner must know that you’re the leader of the pack and it is YOU who is in charge. When you have a dog that does not listen to you, the probability is almost 100% that you have not assumed leadership of your Pack. Your dog does not respect you as the Pack leader. He thinks he is in charge! Always go out or come in through the entry door first – remember you are the leader of the Pack. The leader always goes first, into or out of the den (house). Always eat first – give your Weimaraner something to eat only after you’ve finished your meal. Don’t feed your dog when you are at the table. The leader always eats first and until he feels satisfied. Don’t circle around your Weimaraner when he is lying on the floor – make your Weimaraner move out of your way instead. Remember, you are the Alpha dog. Don’t permit your Weimaraner to sleep with you in your bed – clearly establish his sleeping area. The Alpha always has the best sleeping area. Once you have successfully established yourself as the Alpha, training your Weimaraner and making him listen, will be a lot easier than you can imagine. Does your Weimaraner know her name? 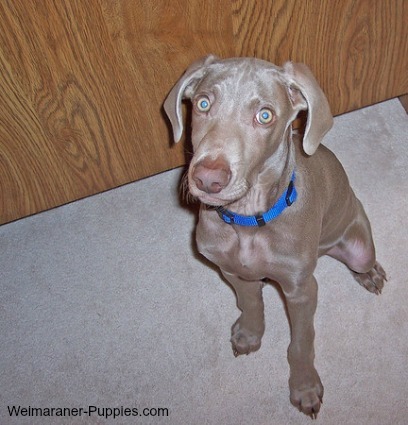 Does your Weimaraner look at you whenever you call him by his name? 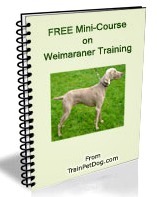 This is the first and the most critical step involved in Weimaraner dog obedience Training. If your Weimaraner doesn’t respond to his name, you will not have his attention for teaching him any other commands. To make sure that your Weimaraner recognizes his name, take a treat in your hand and hold it away from your body. Call your Weimaraner’s name. He is most likely to look at the treat in your hand. Continue calling his name until he turns and looks at your eyes. Give him the treat immediately. Repeat this exercise by holding the treat in the other hand. When you’re sure that your Weimaraner has learned to recognize his name, just call his name and reward him for looking at you by petting or with a hug. Weimaraners respond far better to positive reinforcement than they do to coercion or force.